After my trip out west with no vehicle issues in almost 10,000 km, I decided to get a compulsory vehicle (emissions) e-test to get a two year vehicle license renewal. The shop I went to said they couldn’t get a reading from my diagnostic plug and suggested I go to the dealer for them to check it out and do the test. I waited a few days and then dropped into another shop and got the same problem. So now I figure I’d go to the dealer and get it checked out. I made an appointment and after a couple of hours, they reported the same issue and said it was my computer. A new one was over $1,000.00, but they couldn’t get one so they were able to find a used one in Halifax for $160.00 but that it would take a few days to get here and that the installed cost would be around $350.00. A few days later they called to make an appointment to get it installed and I made a note to the service advisor that I wanted the old one, as it worked fine except for the diagnostic issue. A few hours later they informed me that it wasn’t the computer, that there was something else causing the problem. She said they re-installed the old one and were looking into it. In the mean time they offered to drive me home. I told the mechanic working on the car that I had the heater core replaced at the beginning of 2016 and that I had three minor electrical issues ever since, but I didn’t think it was worth the hours required to R&R the dash. He said good to know. They telephoned me later saying that they would not charge me for the computer, but that the senior mechanic said the issue was behind the dash and that they needed to R&R the dash to solve the problem. They gave me a repair cost of 6 hours @ $102.00/hour for $600.00 plus tax and sent me an email to confirm the repair. 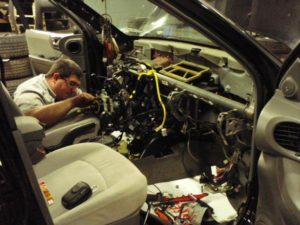 I agreed and added the fact that the dash had been removed and I had three minor electrical issues after that, and since they were removing the dash anyway, they could now fix. As of Friday, Aug 18 – 3:30 pm, I’m still waiting to hear from them. PS: UPDATE: I got a call at 4:50 pm stating that they were still working on my vehicle and that they would give me an update on Monday. This entry was posted in Personal, Science - Technology, Transportation and tagged computer, repairs, Santa Fe by johnrieger. Bookmark the permalink.